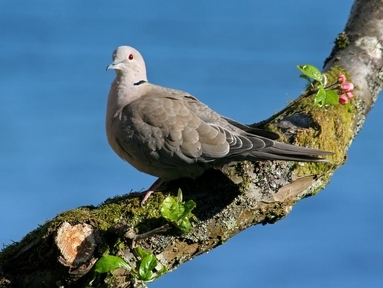 The Collared Dove is a distinctive dove with buffy-pink plumage and black neck collar. It is usually seen singly or in pairs, although flocks may form where food is plentiful. It feeds on the ground but readily perches on roofs and wires. Juvenile Collared Doves do not have the narrow black and white band round the back of the neck which gives the bird its name. In flight, the length of its tail in proportion to its body can make its silhouette look like that of a bird of prey and sometimes other birds make the same mistake, giving alarm calls and dashing for cover. The Collared Dove is now one of our most common birds and its monotonous cooing is a familiar sound. On Arran they are regularly seen round most of the settlements and many of the farms. This was not always the case. The species spread from China and India west to Arabia, North Africa and Asia Minor. It was known to be in Turkey in the sixteenth century. In the mid-twentieth century there was a rapid expansion across Europe. Collared Dove was first recorded in Hungary in 1932, in France in 1952 and it was first recorded breeding in Scotland in 1957. The first bird seen on Arran was as recently as 1966. A number of explanations have been suggested for the ability of the Collared Dove to expand its population range so rapidly. These include the length of its breeding season. It has been recorded breeding in every month of the year with the core breeding season from February to October. In addition, the species can have more than one brood per year with nesting attempts overlapping. Females have been seen feeding the young of one brood during her break from incubating the eggs of another brood. Whatever the explanation, the colonisation of Europe by Collared Dove has been remarkable. Let me know when you first see these birds nesting near you this coming year.